How Do I Order a BoomCase? Check the Store for Ready to Ship Cases and the Customize page to make your own. Does the BoomCase work on 220/240v? Yes. The BoomCase works on 100-240v 50-60hz. Where Can I Buy A BoomCase? The BoomCase is currently carried in these fine stores with a few more on the way. Dijital Fix – San Francisco + Urban Outfitters – NY,Brooklyn,Honolulu,Toronto,LA,Miami,Santa Monica + Score – San Diego + CoStar – Austin,TX + Paul Smith – Milan,Italy + Klein Epstein & Parker – West Hollywood,CA + A.K. Rikk’s – Grand Rapids, MI + Manhattans – South Korea + United Colors of Benetton – Italy/Europe + More! – For the most UP-To-Date List Email Us. How Does The BoomCase Work? Simply Plug your Audio Device into the Aux Input, turn on the power switch and play. See the diagram below for a better understanding of the BoomCase controls. How Long Does It take to Make a BoomCase? Does the BoomCase come with a warranty? Yes. We put a lot of work into each BoomCase. So we will fix most issues that come up for free if you send your BoomCase back to us. If you damage a speaker or your battery goes bad because it wasn’t properly charged we can replace them at cost. Some issues that have come up (and we fixed for free) – accidental breaking of the on/off switch, breaking audio cable inside audio input jack or bending the charging port. We have had this happen to about 5 cases so far. Other than that the BoomCase is pretty solid and will last you a long long time. Just keep it off when not in use and put it on the charger often. How much does the BoomCase weigh? Most BoomCases weigh between 11-16lbs. Our lightest BoomCase is only 6lbs and our heaviest 30lbs. It all depends on size, amount of speakers and options chosen. Yes we do. We have shipped to Italy, The UK, Australia, Germany,The Netherlands, Japan and more. You can expect to pay around $100-175 for shipping. 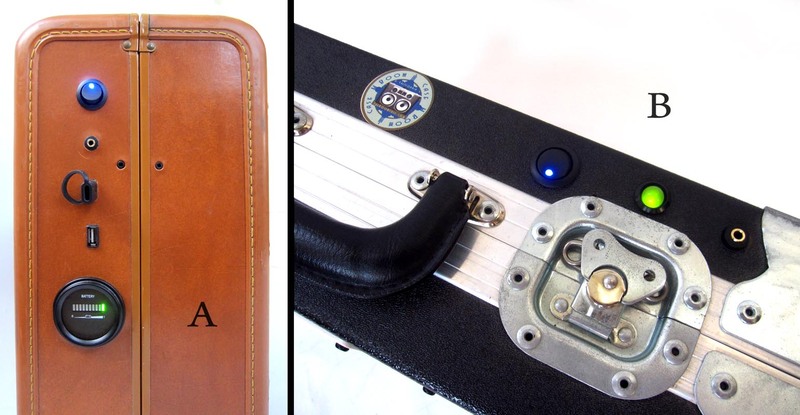 Will the Boomcase work with a electric guitar or synthesizer? Yes. We can configure your Case to accept any type of input but suggest a small headphone amp on certain guitars to get a little extra volume as they are setup to be more like a home stereo versus an actual “guitar amp”. See an example of a BoomCase, a mixer and Synths here – YouTube. You can also use Amplitude for the iPhone. If you look on the right side of this page you will see a Newsletter Sign-up section. If you sign up you will receive the latest news about available BoomCases and Suitcases. We are also on Facebook & Instagram. Can I get protective grills put on my speakers? Of course. We offer speaker grills for most of the speakers on the BoomCase. Prices start at $25. Grills might not be available on the smaller speakers. How Do You Tell How Much Battery Life is Left? We just introduced two new led Battery Meters. A battery Meter is standard on All BoomCases. The Meter will tell you how much charge your battery has left. Any video of the BoomCase in action? Visit our Video Section or YouTube Channel. How does the USB Charger and Battery Charger Work? How Does the 125w Electrical Plug Work? What can I power with it? 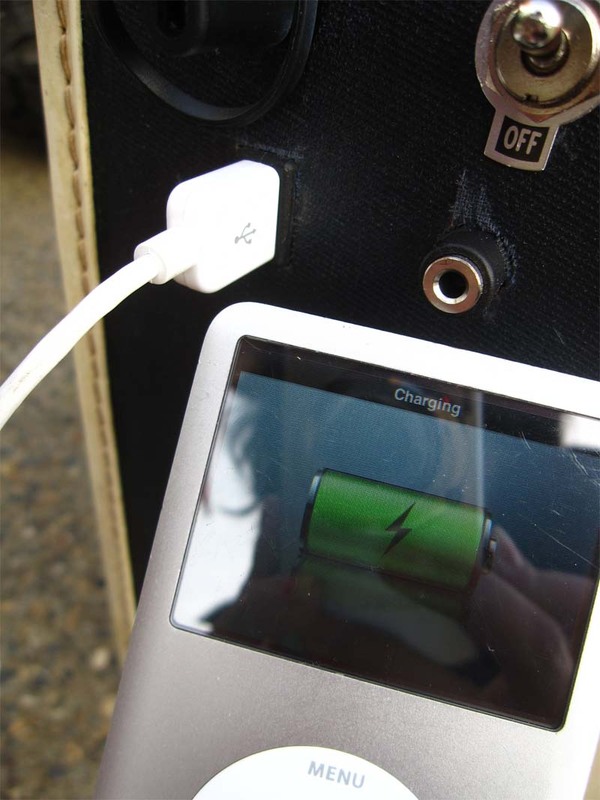 We add an inverter inside the BoomCase and put a plug on the side. This allows you to power devices such as your laptop or a mixer directly off the case. Why Should I Buy A BoomCase over the numerous other companies doing the same thing? Quality.Experience. We know audio. We were the company that popularized the idea of a suitcase boombox. While we definitely were not the first to put speakers in a suitcase (our FedEx driver said he built a suitcase boombox in the 80s) all the companies who have started to copy the BoomCase have only been doing so since 2012. Most of them write that they “researched” how to build a speaker in a suitcase to get started. The BoomCase team has building speaker systems since 1999. We have built numerous vehicles and products (All battery powered) that we have used in parades, as floats and at events long before the BoomCase became what it is. We could not find a decent boombox on the market place and if it did sound good it needed 12+ “D” Batteries and only lasted a few hours. In 2009 we started to build something a little more portable than our previous speaker systems. 1.) It had to have a built-in rechargeable battery. 2.) It had to sound great. In the Summer of 2010 Mr. SiMo decided to put pictures up of a new “BoomCase” on his artist website www.MrSiMo.com and his Etsy Store. Soon After ChipChick.com blogged about us. Engadget.com re-blogged ChipChick.com’s post and the rest is history. 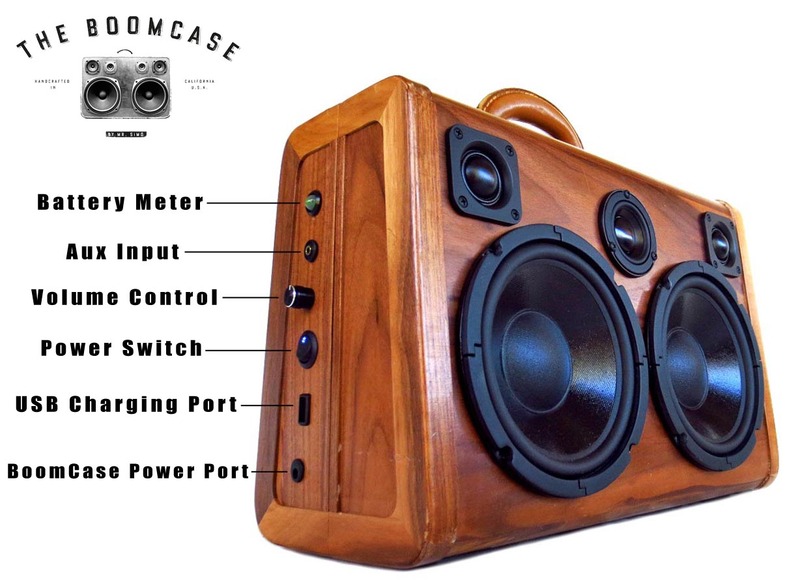 The BoomCase is currently Hand-Made in Sacramento, California and available worldwide. We are opening a new shop in Oakland, CA in late 2013. Each BoomCase is a one of a kind piece. No two BoomCases are the same.